Also, please remember we have now also a Westcoast Rendez-vous in French for the french speaking persons. Check it out! 38 special's lead singer Don Barnes lost album "Ride the storm"! Don recorded a solo album in 1989 which stayed unreleased and will probably never see the light of day. "ride the storm" features Don Barnes (Guitars & Vocals), Mike Porcaro (Bass), Jeff Porcaro (Drums), Alan Pasqua (Keyboards), Dann Huff (Additional Guitar), Bill Cuomo (Additional Keyboards), Denny Carmassi (Drums) and Jesse Harms (Keyboards). 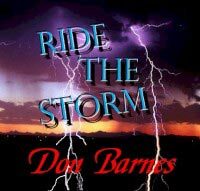 You can listen to "Ride the storm" by Don Barnes here! ENJOY! !